In last week’s post—“Prepare to Win”— I noted that building a base of solid functional strength and durability keeps you in the fight and prevents weakness in general when inevitable challenges arise. Of course, building that base requires a dedicated focus. It requires that you elevate your training to the same level of importance as fueling and recovery. I consider those the three pillars for a powerful foundation from which to launch yourself toward mastery. But without that foundation, you will inevitably falter at some point on your journey. Wandering around a big box fitness center looking for an available exercise machine or treadmill is not considered training in the manner I am speaking of. This is more “wishful exercise” in that you wish for results while exercising, which is better than sitting on the couch. However, you will see little, if any, progress with this approach. Building the right foundation requires the intention of a lifetime approach to training health and functional readiness. The discipline to sustain training through the peaks, valleys and plateaus that this journey has in store for you requires dedicated focus and a winning attitude. Find the fun. Finding the fun in training is key. 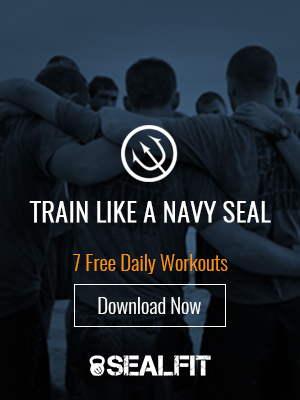 Most people dread working out, but at SEALFIT you will learn to have a blast. The energy that drives our training comes from (at least) three things: First is the fun of training with a team and the camaraderie it builds. Second is the exhilaration that comes from succeeding at difficult tasks. Finally, we have the joy of constantly learning and improving. All of these make a disciplined training plan fun and sustainable. Now you may find other reasons for fun, such as the fun of making progress toward realizing a huge goal or challenge, like preparing for 20X Challenge or Kokoro camp, or training for a special ops selection program like BUD/S. Or the fun may be losing excess weight and packing on muscle. Finding the fun that will fuel you during tough training sessions is key, and a personal thing. It’s not about what someone else wants for you; it’s about what makes you motivated – seek to understand who you truly are and what drives you. Appreciate hard. You may not enjoy pain, soreness, occasional injuries or being defeated, but with the right attitude you will reframe these and value their inherent positive lessons. You can look back on the snags and realize they were important stepping stones necessary to achieving your goals. Consider them part of your training and appreciate them, and you’ll soon be growing emotional resiliency. Freedom through discipline. Consistent effort and showing up to do the work – this is discipline. Discipline is a habit, the only habit that leads to true freedom in life. Be steady, week in and week out. As mentioned above, integrated training, fueling, and recovery are the three pillars of optimal health, so discipline yourself with them now! Don’t bump a training session without serious thought and consideration. If you must, make it up. When you travel, you train. When it snows, you train. When you’re injured, you train. Make the decision now and allow for no excuses. Freedom is earned. Measure your progress. Many of you have worked with a coach or private trainer who has tracked your progress. Good enough…but it is better to develop the awareness to notice and track your own progress. Then you can celebrate your new achievements and milestones. Day by day, in every way, you get better and better. Forward…march. Grow. Lock in your growth mindset in every area of your life. Five mountain training leaves no openings. Learn to love to grow, adding new awareness, knowledge, and skills in a steady upward (vertical) and outward (horizontal) growth. Soon you’ll see through the eyes of a kid again – which is when you will know your cup is finally empty and the world is your playground! Developing these attitudes will greatly aid your success in any pursuit –especially one as demanding as SEALFIT integrated training. So find some time for yourself, open up your journal, and ponder where you stand with these attitudes. Then go get busy. P.S. If you’re interested in taking the first steps toward mastering the full-range of SEALFIT training principles and programming, you should join my elite coaching team and me at SEALFIT HQ, November 14-15, for the Basic Training Certification. Click Here to learn more. Always appreciate your blogs. They always let me know that my team mate are on the right path of becoming SEAL FIT. Excellent material! Thank you for following your passion and inspiring others to new levels of success. Wow, this post was extremely powerful for me. Thank you. I had my journal open from the first paragraph to take notes. I listed exactly what it means to me to train, fuel and recover physically, mentally, emotionally and spiritually. It’s a lot- it’s no small joke. But I know I can do it. I do half of it already. It’s just organizing and then showing up to be able to do it completely. Thank you again for this post. It is just what I needed this morning!